This chapter explains how to place a chart on a Zen page. Every chart is an SVG component as described in the chapter Zen and SVG and is derived from the class %ZEN.SVGComponent.svgComponent. Charts follow the layout and style conventions for SVG components, but add specific behaviors of their own. Zen reports callback charts use the same syntax as Zen pages to display charts. 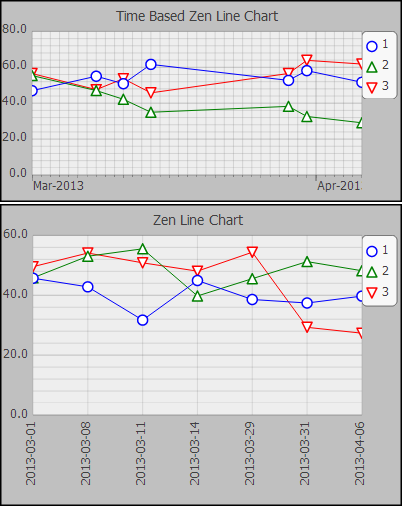 Callback charts are defined in the package %ZEN.Report.Display.COSChart, and all of the chart element names begin with the letter c, for example, <cbarChart>. 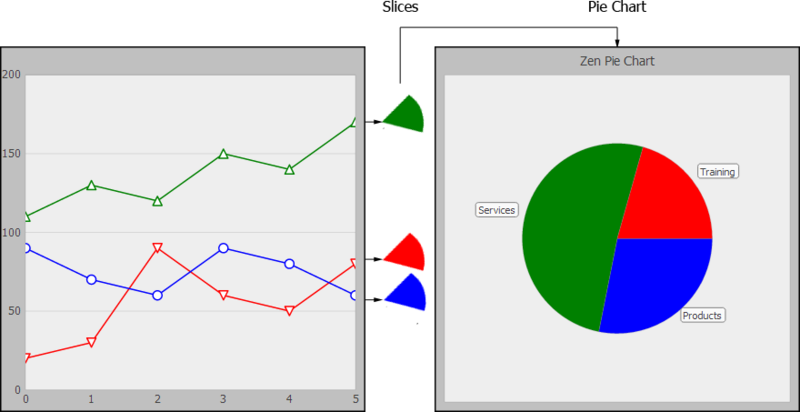 See Using Callback Charts in Zen Reports. 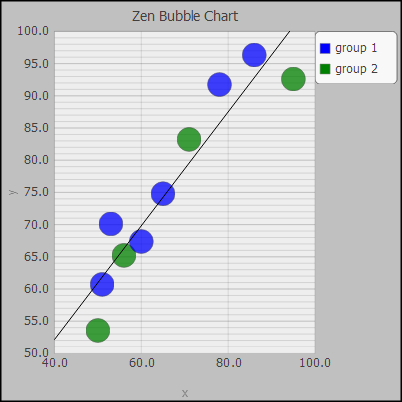 Syntax described in sections Types of Chart, Chart Layout, Style, and Behavior and Chart Axes applies equally well to charts in Zen pages and callback charts in Zen reports. XPath charts is an older implementation of charting in Zen reports which uses syntax different from Zen pages. 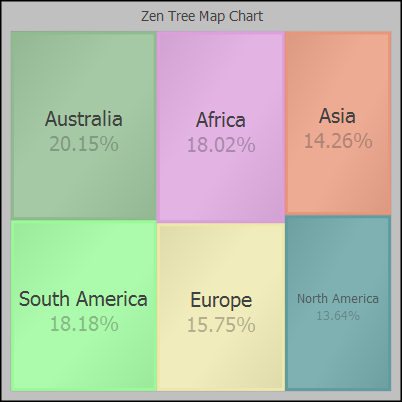 See Using XPath Charts in Zen Reports. 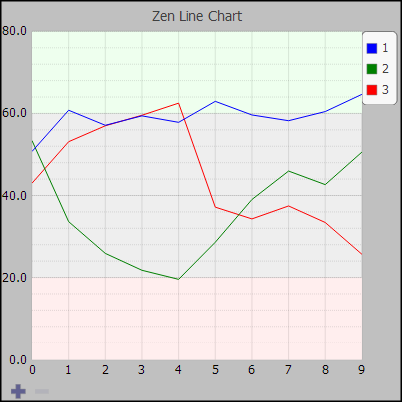 Techniques for providing data for charts in Zen pages are different from both callback charts and XPath charts in Zen reports. See Providing Data for Zen Page Charts in this book and Providing Data for Zen Report Charts in the book Using Zen Reports. 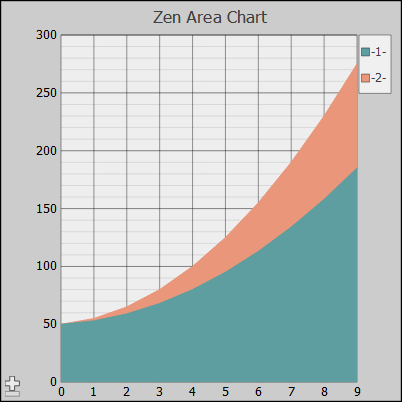 The base chart class %ZEN.SVGComponent.chart defines the data, grid (axes and scales), styles, and legend used by charts. You can think of charts as occupying a virtual coordinate space that measures 100 units by 100 units. Internally, charts are plotted in terms of pixels, which allows you to specify size and positioning parameters in pixels as well as in terms of the virtual coordinate space. See Specifying Size and Position. Within the total space occupied by the chart, there is a smaller plot area where the chart plots the data. Margins define the space around the plot area. Generally you use these margins as space in which to display the labels and legend for the chart. A <barChart> displays one or more data series as a set of vertical or horizontal bars. 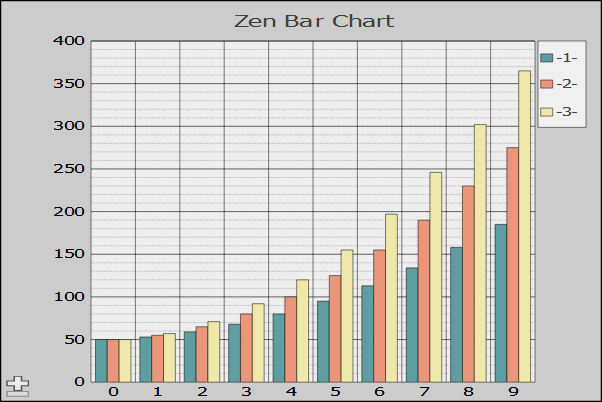 The following figure shows a Zen bar chart displaying data from three data series. <barChart> has the same general-purpose attributes as any chart. 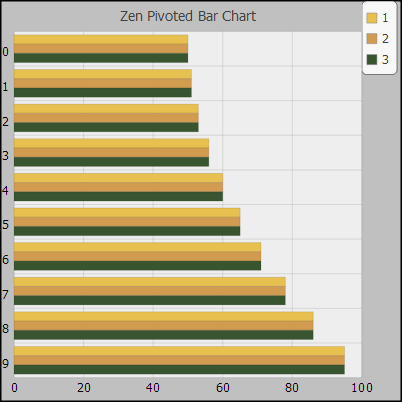 For descriptions, see the sections Providing Data for Zen Page Charts and Chart Layout, Style, and Behavior. The plotToEdge attribute is always false for <barChart>. The end time for a timeBased x-axis. If true, display the chart as a number of small charts, one per data series. See showMultiples. The start time for a timeBased x-axis. If you supply a third series, the chart uses that data to draw the radius of each bubble. Values in the radius series are scaled and multiplied by the value of the radius property. The following figure shows a chart with x, y and radius data series. Note how the default partial transparency of the bubbles lets you see the shapes even when they overlap. The property opacity controls this characteristic. Note also that in this example, the value of showQuadrant is true, so the chart area is divided into quadrants. You can supply up to two additional data series. The fourth series determines how colors are applied to the data bubbles, and the fifth controls opacity of bubbles. Values in the fourth, or color data series can be any arbitrary data. The chart establishes color categories for each new value encountered in the series, and assigns the colors to corresponding bubbles on the chart. The chart uses the colors that are currently in effect, see seriesColors and seriesColorScheme. The following code fragment shows the part of an ongetData handler that sets up a color data series. /// Callback to provide data for bubble chart. data[i] = (i%3)? "group 1":"group 2"
The following figure shows the resulting chart, with colors applied to randomly generated data. Note that in this chart, the value of showRegression is true, so the chart contains a computed linear regression line, and showQuadrant is false, so the chart does not show quadrants. The property lineStyle provides a style specification for the regression line. Values in the fifth, or opacity data series can be any arbitrary data. Values in the opacity series are scaled and multiplied by the value of the opacity property. Values are not normalized, so a large range in values can result in the smallest values being driven to 0 and becoming invisible. The following figure shows the resulting chart, with opacity applied to random generated data. Note also that the quadrants have been modified by setting the property xCenterValue, and the properties upperRightStyle and lowerLeftStyle have been used to modify the quadrant colors. SVG CSS style definition applied to the regression line. CSS style value to be applied to the lower left quadrant background. Default opacity (from 0 to 1) for bubbles. If you have provided an opacity series, its values are scaled and multiplied by this value. Values in the opacity series are not normalized. Default radius (in logical units) for bubbles. If you have provided a radius series, its values are scaled and multiplied by this value. If true, then divide the plot area into quadrants, and apply color to the upper right and lower left quadrants. The default value is true, and the default colors are red in the upper right quadrant, and green in the lower left.. If true, then draw a computed linear regression line. The x-axis value to use when drawing background quadrants. The default value is the center of the x-axis. The y-axis value to use when drawing background quadrants. The default value is the center of the y-axis. CSS style value to be applied to the upper right quadrant background. 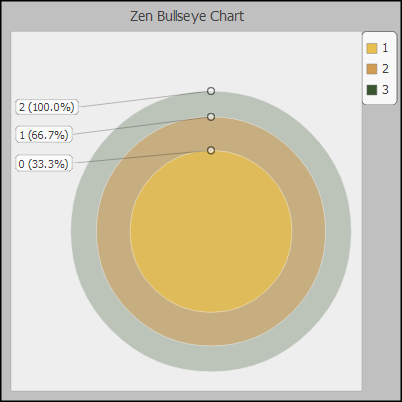 A <bullseyeChart> displays data items as concentric circles. Bullseye charts are often used in situations where the largest circle shows the entire data set, the next circle shows data items that meet some relevant set of criteria, and the next circle shows data items that meet additional criteria. For example, if the largest circle shows the total number of patients in a study, the next circle might show patients with diabetes, and the smallest diabetic patients undergoing a specific treatment. A <comboChart> displays multiple data series in a single chart, using area, bar and line charts. The following figure illustrates all three chart types. You can use other chart elements to plot multiple data series using a single type of chart, but <comboChart> sometimes offers advantages. For example, you can chart multiple filled line charts using <lineChart>, but <comboChart> may be a better choice, because it renders area charts with partial transparency, so all of the chart areas are visible, even when they overlap. You can also use the attribute seriesTypes to display one of the data series as target lines. The following figure shows a chart where the fourth data series supplies target lines. SVG CSS style definition applied to lines in the chart. Comma-delimited list of types that indicates how the corresponding series in the chart should be displayed. Possible types are: line, area, bar, and target. The default type is bar. If the type is target, the corresponding data series is used to put target lines on the chart. Area charts are rendered with partial transparency and placed behind all other chart types. Line charts are rendered in front of bar charts. The first series provides a set of reference data values. The second data series provides values that you want to compare to the reference data set. The <diffChart> shades the area between the two series using the color of the second data series. To further distinguish between the series, the chart draws a line representing the reference series across the shaded area of the chart. This line uses the color of the first, or reference data series, and can take additional styling from the refLineStyle attribute. <diffChart> does not support chartPivot. A series of high values sets the top (right) limit of each bar. A series of low values sets the bottom (left) limit of each bar. (Optional) The closing values. The chart places a marker on each bar at these values. Each low value is assumed to be smaller than its corresponding high value. Each closing value is assumed to be between its corresponding high and low values. The chart uses its first seriesColors value to plot all bars and marker. It ignores the colors provided for the other series. 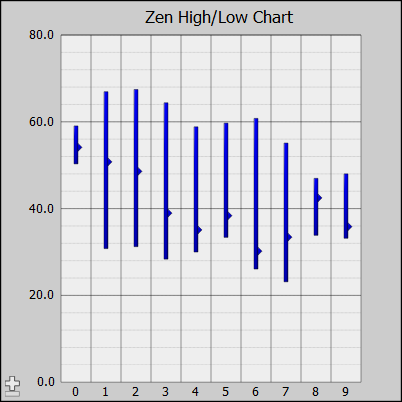 Chart attributes <hilowChart> has the same general-purpose attributes as any Zen chart. For descriptions, see the sections Providing Data for Zen Page Charts and Chart Layout, Style, and Behavior. The plotToEdge attribute is always false for <hilowChart>. SVG CSS style definition. Specifies the style used for bars where the high value is less than the low value. A <lineChart> displays one or more data series as a set of lines. The following figure shows a simple line chart. If true, the area under each line is filled (as in an area chart). If false, it is not filled (as in a line chart). SVG CSS style definition applied to lines in the chart. A color specified in this attribute takes precedence over colors specified in seriesColors. You can use ongetLabelX to provide labels for the bars, and seriesNames to provide labels for the legend, matching names to colors by order in the series. Pie charts can plot single or multiple data series, and can show the series, the items in the series, or both. <pieChart> does not support axes or grids in the plot area, as do line charts or bar charts. A <pieChart> that plots the items in a single data series displays a circle with radial slices representing items in the series. The chart adjusts the size of each slice to be proportional to the contribution of that item to the total. Note that the end user can rotate the pie chart with click and drag gestures in the browser. Controls whether a hole is displayed in the center of the pie chart, and if so, how big the hole is. The value of this property is a percentage of the chart's radius along the x-axis. If the size of the chart changes, the size of the center hole maintains its proportional size. The value can range from 0 to 0.9. Values larger than 0.9 have no additional effect. The default value is 0.
pieHeight Controls the apparent height of 3D pie charts. The value of this property is a percentage of the chart's radius along the x-axis. If the size of the chart changes, its depth maintains its proportional size. The value can range from 0 to 1. The default value is 0.33.
pieScale Decimal value that specifies the scaling factor for the size of the pie within the chart. The default scaling value is 1.0. A value larger than 1.0 makes the pie bigger relative to the plot area; a value smaller than 1.0 makes the pie smaller. rotateBy If specified, rotate the pie chart by this amount (in degrees). If true, percentage values (rounded to nearest integer) are displayed as part of the label for each slice. The default is false. 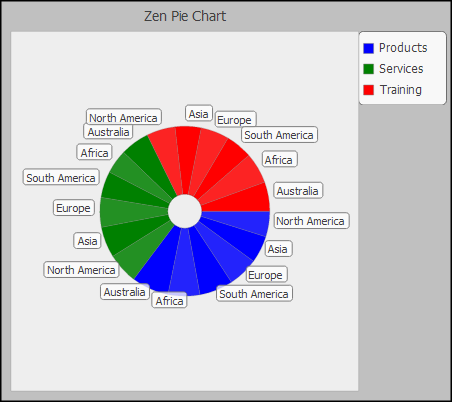 The <pieChart> plotBy attribute controls how Zen generates a pie chart from the data provided. You may actually provide multiple series to the <pieChart>. The chart processes all the data series to create one series, and then displays that series as slices in the chart. plotBy options are as follows. "items"  plot a slice for every item in this chart's data. "series"  plot a slice for every data series in this chart's data. "both"  plot a slice for each item within each data series, which means that the chart contains seriesCount * seriesSize slices. "auto"  automatically select the appropriate way to display data based on how many data series and items are present. When the value of plotBy is "items", a <pieChart> plots one slice for every item within the data series. If you provide multiple data series to an "items" pie chart, each slice of the pie represents the total of a particular item, summed across all of the data series in the chart. The following conceptual figure shows how three data series, each containing six items, would generate an six-slice pie chart. Each slice represents the sum of the values for that item provided by the three series. When the value of plotBy is "items", labels for the slices are treated as <yAxis> labels. This means you cannot specify them directly using a chart attribute such as seriesNames. Labels are provided by a %ZEN.Auxiliary.dataController, if present, or you can provide an onGetLabelY event handler to get the label values. When the value of plotBy is "series", multiple series are in use. The <pieChart> plots one slice for every data series, so the number of slices in the pie chart is seriesCount. Each slice represents the sum of all the items within one of the series. The seriesNames attribute provides the labels for the slices, and for the legend. The following conceptual figure shows how three data series, each containing six items, generate a three-slice pie chart. Each slice represents the sum of the eight items in that series. When the value of plotBy is "both", multiple series are in use. The <pieChart> plots one slice for every item in every data series, so there are seriesCount times seriesSize slices. The base color for each slice is the associated series color. Alternating slices use dark and normal shades of this color. The chart legend displays series names; the seriesNames attribute provides these labels. The slices display item names; the labels are provided by an onGetLabelY event handler, or a data controller. The following pie chart example compares three series (Products, Services, and Training), each of which has data items in four categories (America, Asia, Europe, and Africa). The chart has twelve slices. Any additional data series are plotted as y values correlated to the x values provided by the first series. The result is that an <xyChart> always displays one less plot than its number of data series. The seriesCount value must always be one more than the number of plots you want to display. This leaves room for the first, x-value series. The seriesColors list applies to the second, third, and successive series. The seriesNames list applies to the second, third, and successive series. The markerShapes list applies to the second, third, and successive series. plotStyle="stroke:none;". This is a better approach than setting plotStyle="stroke-width: 0;", because some SVG implementations render a very thin line, even when stroke-width is set to 0. If false, the first data series is used to supply x values for the chart and all other data series provide y values. If true, then the chart displays multiple x series. In this case, the first data series provides the first set of x values, the second data provides the first set of y values, the third data series provides the second set of x values, and so on. This property is optional, and the default value is false. A <treeMapChart> plots the items in a single data series and displays each item in the series as a rectangle and arranges them in a larger rectangle. The chart adjusts the size of each smaller rectangle to be proportional to the contribution of that item to the total. You can display more than one data series by setting the attribute showMultiples to true. Each of the multiple charts displays a different data series. Using a Data Controller, by setting the chart’s controllerId attribute. Regardless of which technique your chart uses to retrieve data, you can limit the data returned by either technique to the desired number and size of series. 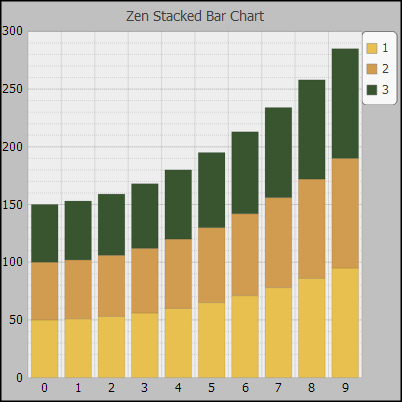 When it comes to displaying charts, Zen pages and Zen reports use identical syntax. Syntax described in the previous section, Types of Chart, and in the later sections Chart Layout, Style, and Behavior and Chart Axes applies equally well to Zen pages and Zen reports. 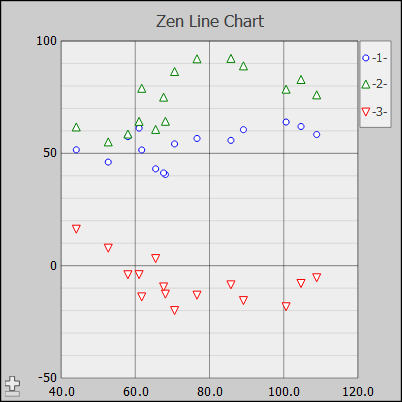 However, the techniques for providing data for charts in Zen reports are different from the techniques for Zen pages. 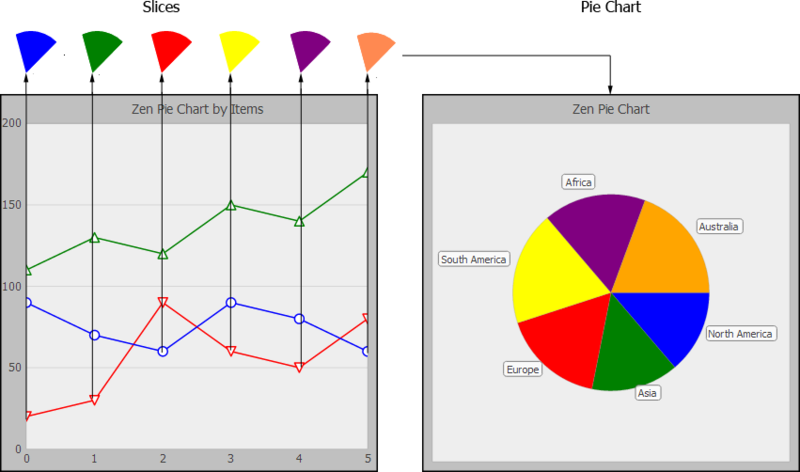 For details, see the section Providing Data for a Zen Report Chart in the book Using Zen Reports. 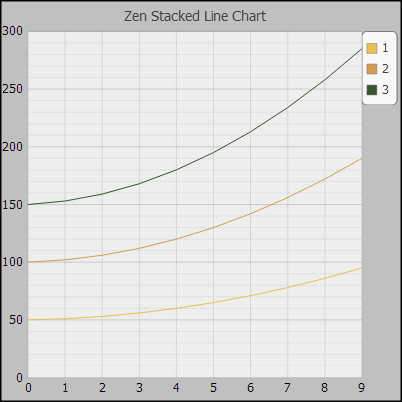 To provide data for charts on Zen pages, use the topics in this section. All charts support the ongetData attribute for generating chart data. In Zen reports, ongetData is a server-side method written in Object Script or other appropriate language. The method puts seriesSize - 1 items into an array and returns that array. It can use whatever approach is appropriate to provide data for the chart. For instance, it may use a switch statement based on the value of the series input argument. The previous example creates a chart with random data. When our example page is first displayed, its %OnAfterCreatePage method calls a server-side method PopulateData() to place values into a page property called Population for later use by client-side code. In our example, this happens only once, when %OnAfterCreatePage is called. Later user actions may change how this data is viewed, but in this example, we only get data from the server once. Set ..Population = ..Population _ rs.%Get("PersonCount") _ ","
Set ..States = ..States _ rs.%Get("HomeState") _ ","
Set query(1) = "SELECT HomeState, COUNT(ID) As PersonCount"
Set query(2) = "FROM Person"
Set query(3) = "GROUP BY HomeState"
Set query(4) = "ORDER BY HomeState"
"Error in %Execute. %SQLCODE = "
The client-side method changeSeriesSize() uses the text value from the selected <option> and uses it to reset the seriesSize value for the <barChart> whose id is chartPop. This is our example <barChart> as shown in step 4. When the seriesSize is reset, the chart redisplays. controllerId Identifies the data controller that provides the data for this chart. The controllerId value must match the id value provided for that <dataController>. The chart’s controllerId value must match the <dataController> id value. The chart takes its seriesSize from the number of properties in the <dataController> modelClass. The following attributes from the base class %ZEN.SVGComponent.chart tell the chart how many series to use, and how many of the items in each data series to use, when constructing the chart. All types of chart support these attributes. If you do not use a dataController to provide the data set, you must specify both seriesCount and seriesSize. If you use a dataController, Zen determines the number of series and items from the data. seriesCount Positive integer specifying the number of series in the chart. 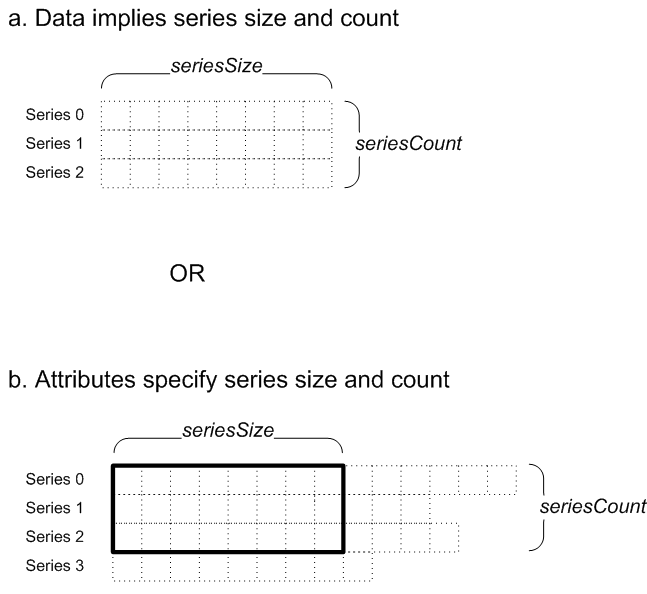 If you do not use a dataController and your data source provides a larger number of series than you want to use, you can trim the number of displayed series by setting seriesCount to a smaller number. The following figures illustrate the action of seriesCount. seriesSize Positive integer specifying the number of items within each data series to display on this chart. If you do not use a dataController and your data source provides a larger number of items in the series than you want to use, you can trim the number of displayed items by setting seriesSize to a smaller number. The following figures illustrate the action of seriesSize. 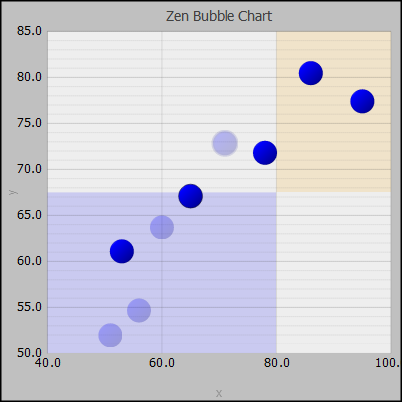 The following diagram shows the major components of a Zen chart. The chart properties described in the following sections control the positioning, style, and behavior of these components. Chart properties include those from the SVG component class %ZEN.SVGComponent.svgComponent, such as width andheight, and those from the base chart class %ZEN.SVGComponent.chart, such as marginTop and borderOffset. Do not specify a value, and let Zen calculate the value automatically. Use a value from 0 to 100 that is interpreted as a percentage of the current chart size. 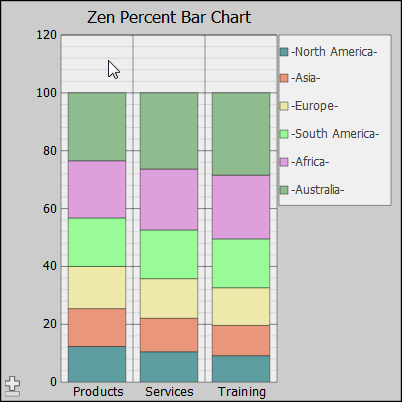 The following attributes from the base class %ZEN.SVGComponent.chart determine the background style and the position of the plot area within the chart. backgroundStyle SVG CSS style definition. Specifies the style for the background panel. This is the area outside the plot area but inside the chart component’s height and width. SVG CSS style definition. Specifies the distance in pixels between the background rectangle and the border. The default value is 8. Specifies the radius in pixels used to round the corners of the chart's background rectangle and border. SVG CSS style definition. Specifies the style used for the border line which is inset from outer edge of chart. If true, display zoom in/out buttons (for certain chart types). The default value is false. The property scrollButtonStyle controls the appearance of the buttons. marginLeft See marginBottom in this table. marginRight See marginBottom in this table. marginTop See marginBottom in this table. Controls the appearance of this chart. A value of "2D" provides standard two-dimensional chart appearance. A value of "3D" gives the chart a three-dimensional appearance so that the plot area appears to be recessed. Certain chart types, such as bar charts, display items with a 3D look. For pie charts, setting this property to "3D" displays a pie chart with a 3D appearance, but does not affect the plot area. The default value is "2D" for some charts and 3D for others. Specifies how the chart handles text elements when it is resized. If true, the text scales in proportion to the chart and all requested labels are rendered regardless of legibility. If false, the size of the text elements is fixed with respect to the page and some labels may be omitted to avoid visual overlap if there is not enough space on the chart to render the all values. axisLineStyle An optional SVG CSS style definition applied to line drawn for x- and y-axes. axisTitleStyle An optional SVG CSS style definition applied to the title specified by the title property of the axis. bandLower Decimal value. If defined, the chart displays a colored band on the plot area covering the range lower than this value. bandLowerStyle defines the style of this band. bandLowerStyle SVG CSS style definition for the band defined by bandLower. bandUpper Decimal value. If defined, the chart displays a colored band on the plot area covering the range higher than this value. bandUpperStyle defines the style of this band. bandUpperStyle SVG CSS style definition for the band defined by bandUpper. baseLineStyle SVG CSS style definition for the base line. gridStyle SVG CSS style definition. Default style applied to all grid line elements within the plot area for this chart. If defined, gridStyle overrides any styles define in the CSS style definition for the page, but gridStyle is in turn overridden by any styles defined by a specific axis element in the chart. labelStyle SVG CSS style definition. Default style applied to all label elements for this chart. If defined, labelStyle overrides any styles define in the CSS style definition for the page, but labelStyle is in turn overridden by any styles defined by a specific axis element in the chart. If true, display axis labels for this chart (or slice labels for a pie chart). If false, hide labels. The default is true. The maximum number of characters to display for an axis label. The default value is 20. 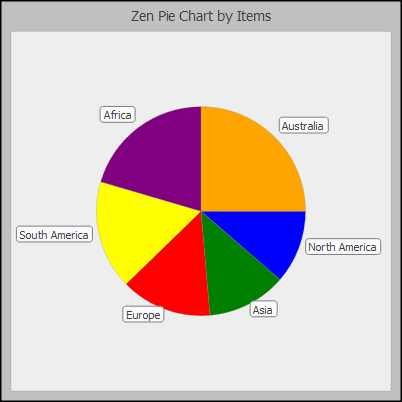 For pie charts, ongetLabelY is the attribute to use to set slice labels. ongetSeriesColor The ongetSeriesColor event handler. The chart calls this event handler to get the color for a given data series. The event handler is passed an argument ,series, that contains the 0-based ordinal number of the series. If the event handler does not return a color for series, the chart uses whatever color is specified by seriesColors, seriesColorScheme, or seriesColorsOverride. Specifies an optional event handler. If an event handler is defined, it is called by the chart just after it has finished displaying grid lines and data. The event handler is passed an argument chart that is the current chart object. It is also passed a group, which is the SVG group to which any new SVG content should be added. Not supported by Zen reports. plotAreaStyle SVG CSS style definition for the plot area panel for this chart. 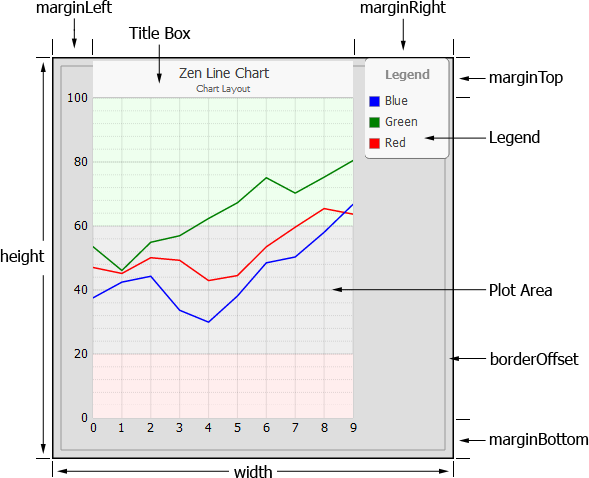 SVG CSS style definition applied to the left and bottom edges of the plot area panel for charts that have a 3D appearance. plotStyle Default SVG CSS style definition applied to the SVG elements that are used to plot data for this chart. These elements include the line in a line chart, or the bar in a bar chart. An optional SVG CSS style definition applied to the zoom and scroll buttons. Use the hasZoom property to make the zoom and scroll buttons visible. Comma-separated list of CSS color values to use for data series. The chart applies these colors to each data series in ordinal order (series 0 gets the first color, series 1 the second color, and so on). If you omit seriesColors, the chart uses the colors defined by seriesColorScheme. This is the name of a built-in color scheme used to plot data series for the chart. Possible values are: urban, tuscan, caribbean, rustbelt, bright, glow, gray, pastel, and solid. The default value is "tuscan".seriesColors overrides this property. Additional comma-delimited list of CSS color values used for data series. If supplied, this is merged with the colors in the seriesColorScheme or seriesColors list. Comma-separated list of names to use for data series. The chart applies these names to each data series in ordinal order (series 0 gets the first name, series 1 the second name, and so on). These names can appear as labels for the series in the legend chart. The seriesNames attribute has its ZENLOCALIZE datatype parameter set to 1 (true). This makes it easy to localize its text into other languages, and permits use of the $$$Text macros when you assign values to this property from client-side or server-side code. Any localized seriesNames string must remain a comma-separated list. Comma-separated list of numbers. These numbers correspond to multiple y axes defined by the chart. The chart uses the axis identified by the number to plot the corresponding data series. The numbers are 0based. By default, the every data series uses y-axis 0. For example, if seriesYAxes="1,2,0", the chart plots the first data series on second axis, the second data series on the third axis, and the third data series on the first axis. Note that <xyChart>, <diffChart> and <bubbleChart> do not support alternate yAxes. An optional SVG CSS style definition applied to grid stripes when stripes have been enabled with the property stripesVisible. If true, draw stripes over value axis grid lines. The default value is false. Adjusts the size of text used in the chart title and axis labels. Possible values are: small, medium, and large. If the value is "medium", the chart uses the default font sizes specified by the CSS. if "small" or "large" adjust the size of any text in the chart that does not have an explicit style set by a property. An optional SVG CSS style used to indicate unselected chart elements. Used when there is a selected element. An optional SVG CSS style definition applied to the box that contains the value labels. Use the property valueLabelsVisible to make the labels visible. Specifies a format applied to the numeric values in value labels and tooltips. For a description for this format string, see the section Format String Field in the book Defining DeepSee Models. Use the property valueLabelsVisible to make the labels visible. An optional SVG CSS style definition applied to value labels. This only applies to charts that display element values, such as bar charts. Use the property valueLabelsVisible to make the labels visible. Specifies whether values should be displayed for elements within the chart. This only applies to charts that display element values, such as bar charts. A number of attributes are supported by several chart types. These attributes are listed in the table of attributes for the relevant charts, and described in more detail in the following sections. If the attribute chartPivot is true, rotate the chart so that the x-axis is vertical and the y-axis horizontal. If false, display the chart in typical fashion, with x-axis horizontal and the y-axis vertical. The following figure shows a pivoted bar chart. The attribute chartStacked comes into play if there are multiple data series. If true, the data series are drawn stacked on top of one another (values are additive). If false, the bars appear side by side (the values are independent). If the attribute showMultiples is true, charts that support small multiples display the data as a set of small charts, one for each data series. The chart method hasMultiples lets you determine whether the chart supports multiples. 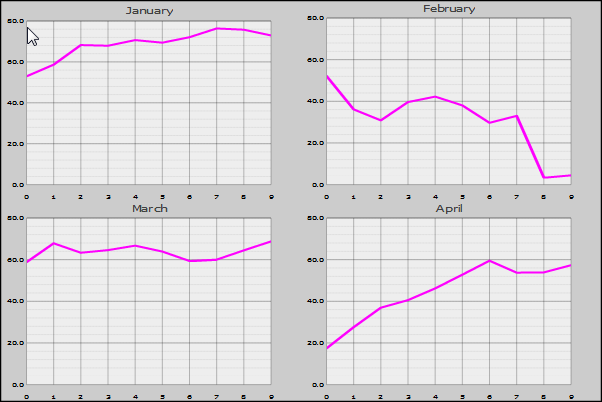 The following figure shows a line chart with four data series and showMultiples="true". The attribute timeBased specifies that the x-axis is a time line. It is valid only for line and combo chart types. In order to plot a time based chart, you must use the ongetLabelX callback method to provide time values in the format YYYY-MM-DD or YYYY-MM-DD HH:MM:SS. These values are placed in their proper position on the x-axis timeline. Because the logic that positions values on the timeline depends on the returned date values, you cannot set the property maxLabelLen to a value less than ten. The chart properties startTime and endTime set the start and end dates for the time line. If you do not supply values for startTime and endTime, the chart uses the earliest and latest values returned by the ongetLabelX callback method. The following figure illustrates the effect of a timeBased x-axis. The top chart uses a time based x-axis, while the lower chart plots the same x values on a category axis. Markers are shapes that are placed at each data point along the chart. If the chart has multiple series, each series in the chart can use a different shape for its marker. Marker attributes apply only to types of chart that support markers (that is, line charts). 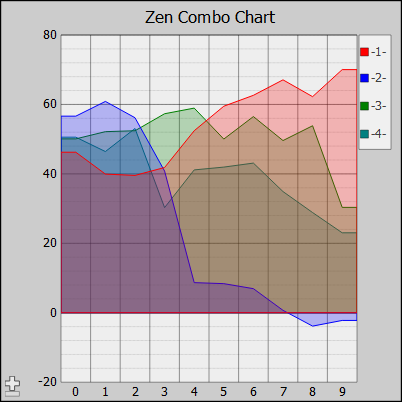 The base class %ZEN.SVGComponent.chart offers the following marker attributes. markerScale Decimal value that specifies the scaling for markers. A value of 1.0 (or "") displays markers with the default size. Use a larger value for larger markers, smaller for smaller markers. The default value for markerShapes is "circle,up,down,square"
markerStyle SVG CSS style definition. Style applied to all marker elements for this chart. The default is to outline the shape in the same color as the series plot, and fill the shape with white. If true, and this chart supports markers, markers are displayed for the data points within the chart. If false, no markers are displayed, even if they are defined. The default is false. 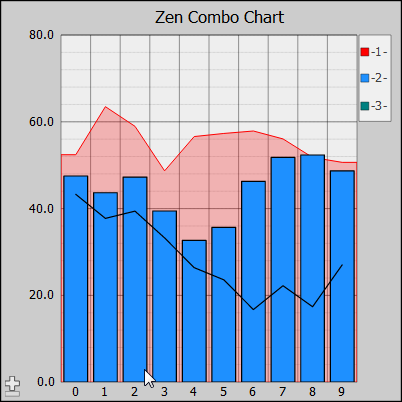 The following attributes from the base class %ZEN.SVGComponent.chart determine the style of the chart legend and whether or not it should display. legendHeight If this chart has a legend, this is the height of the legend box (within the chart coordinate space). You can provide a value as specified in Specifying Size and Position. The default height is based on the number of data series. legendLabelStyle SVG CSS style definition for label text in the legend box. legendRectStyle An optional SVG CSS style applied to the rectangle that indicates the current legend in the legend box. Used when the chart has more than one y-axis. legendStyle SVG CSS style definition for the background of the legend box. legendTitle Title to display in the legend box. If true, display a legend for this chart. The default is false. legendWidth If this chart has a legend, this is the width of the legend box. You can provide a value as specified in Specifying Size and Position. If no legendWidth is specified, the chart assigns a default width of 15.
legendX If this chart has a legend, legendX provides the x-position of the top left corner of the legend box within the chart coordinate space. You can provide a value as specified in Specifying Size and Position. If you provide a value relative to the coordinate space, the top left corner of the chart is (0,0) and the bottom right corner is (100,100). The default position for the legend is in the top-right corner of the chart. legendY If this chart has a legend, legendY provides the y-position of the top left corner of the legend box within the chart coordinate space. Provide values as for legendX. The default position for the legend is in the top-right corner of the chart. 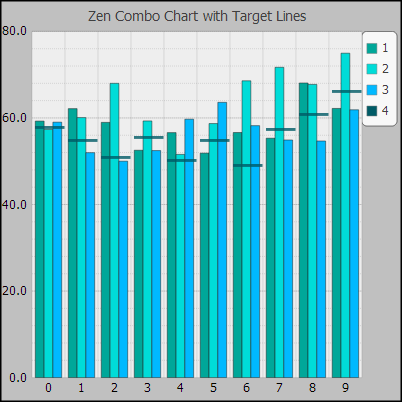 The following attributes from the base class %ZEN.SVGComponent.chart determine the style and contents of the chart title. An optional SVG CSS style definition used for the title text in each of the small charts created when a data series is displayed as multiple charts. Used when showMultiples is enabled. Subtitle text for the chart. SVG CSS style definition. Specifies the style for the subtitle text. Title text for the chart. By default, it is centered at the top of the chart area. You can use titleX, titleY, and titleAlign. Alignment for title and subtitle. Possible values are, center, left, and right. The default value is center. titleBoxStyle SVG CSS style definition. Specifies the style for the box that contains the title and subtitle text. titleX If this chart has a title, this is the x-position of the title. This value is applied as specified by titleAlign. For example, if titleAlign is center, titleX positions the center of the title. You can provide a value as specified in Specifying Size and Position. The default is center. titleY If this chart has a title, this is the y-position of the bottom line for the title text. Descenders (for letters such as 'p' and 'q') fall below this line. You can provide a value as specified in Specifying Size and Position. The default position is just below the top of the chart, within the default marginTop. The following attributes control user interactions with the chart. Zen reports does not support any of the properties in this section, because reports are not interactive. If no onelementClick expression is provided, Zen uses its own handler to provide values for selectedItem and selectedSeries. selectedItem 0based ordinal number of the currently selected chart element (such as a marker in a line chart, or bar in a bar chart). This value is -1 if nothing is currently selected. selectedItemStyle SVG CSS style definition for the currently selected item in the chart. selectedSeries 0based ordinal number of the currently selected series in the chart, or -1 if no series is currently selected. 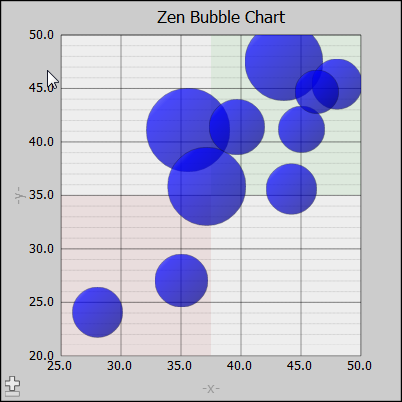 Zen displays all charts except pie charts with x and y axes. Axes determine how chart data is displayed. You can use <xAxis> or <yAxis> elements to specify the range of axis values (minValue to maxValue), or Zen can determine these values automatically based on the range of data values. <xAxis> can be a category axis or a value axis, depending in the type of chart. A category axis names the data categories. A value axis indicates the values of plotted data. <yAxis> is a value axis. title="Line Chart: Two Y Axes"
<yAxis minorGridLines="true" minValue="700" maxValue="1200" labelUnits="100"
The property seriesYAxes associates data series with axes. The property currYAxis specifies the axis that is active when you first display the chart. See Plot Area. The following figure shows the resulting chart. The first image shows the chart as it is initially displayed, with the HDD axis visible. The HDD item in the legend is highlighted to show that it is the relevant data series for the axis currently in use. 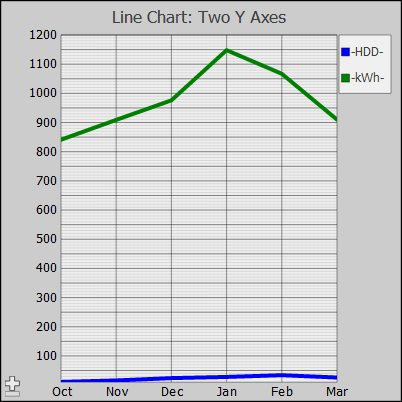 If you click on kWh in legend, the chart displays the appropriate y-axis. All data series associated with an axis are all highlighted when that axis is active. Compare these charts with the following chart, which attempts to plot both HDD and kWh on a single axis. Note that <xyChart>, <diffChart> and <bubbleChart> do not support alternate yAxes. 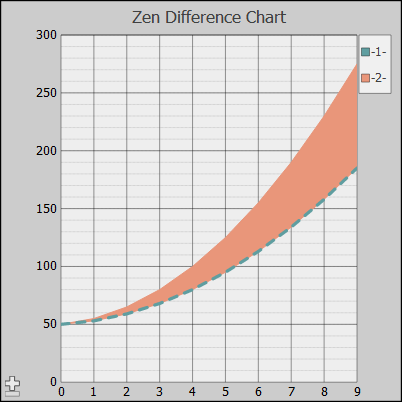 The following attributes from the class %ZEN.Auxiliary.axis are available as attributes of either <xAxis> or <yAxis> within a chart definition. All of these attributes are optional; Zen provides reasonable defaults for each of them based on the data supplied to the chart. axisType Provides additional control over the display of labels for this axis. If the value is a null string ("") the axis shows a value or category label. If the value is "percent" the axis shows a value label as a percentage. axisType also affects the format of the tooltip for values plotted on this axis. If valueLabelFormat is also set, that format takes precedence for tooltips. baseValue For charts with filled regions (bar charts), baseValue is a decimal value that specifies where the base of the filled region should be plotted. If missing or blank (""), the base is the bottom of the plot area. Specifies the side of the chart where the labels for this axis appear. Possible values for a y-axis are "left" and "right", and for an x-axis are "top" and "bottom". The default value is left for a y-axis and bottom for an x-axis. labelStyle SVG CSS style definition for the text labels along this axis. labelUnits Decimal value that specifies the amount of space between labels along a value axis. Ignored by category axes. If labelUnits is missing or blank (""), Zen automatically calculates a value based on the data series. If true, grid lines are displayed for each major unit on this axis. If false, major grid lines are not displayed. The default is true. majorGridStyle SVG CSS style definition for the major grid lines along this axis. majorUnits Decimal value that specifies the amount of space between major grid lines along this axis. If majorUnits is missing or blank (""), Zen automatically calculates a value based on the data series. maxValue Decimal value that specifies the maximum data value along this axis. If maxValue is missing or blank (""), Zen automatically calculates a value based on the data series. minValue Decimal value that specifies the minimum value along this axis. If minValue is missing or blank (""), Zen automatically calculates a value based on the data series. If true, grid lines are displayed for each minor unit on this axis. If false, minor grid lines are not displayed. The default is true. minorGridStyle SVG CSS style definition for the minor grid lines along this axis. minorUnits Decimal value that specifies the amount of space between minor grid lines along this axis. If minorUnits is missing or blank (""), Zen automatically calculates a value based on the data series. Title text for the axis. When you work with %ZEN.SVGComponent.chart subclasses programmatically, you work with axes as the xAxis and yAxis properties of the chart object. Each of these properties is a %ZEN.Auxiliary.axis object with properties corresponding to the attributes listed above.